Wabash College invites you to a talk by Salmaan Keshavjee, Director of the Harvard Medical School Center for Global Health Delivery-Dubai. His talk will take place at 7:30 p.m., Thursday, Sept. 21, in Baxter Hall, Room 101 (Lovell Lecture Room). 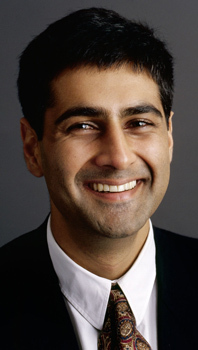 Keshavjee is a physician and anthropologist, with experience in health policy reform. He has worked in sub-Saharan Africa, post-soviet Tajikistan, the Middle East and Central Asia, and his professional interests and activities embody the liberal arts experience. He worked closely with Dr. Paul Farmer and Partners in Health to implement a multi-drug resistant TB treatment program in Tomsk, Russia. He is the author of Blind Spot: How Neoliberalism Infiltrated Global Health. His talk is free and open to the public. Keshavjee will be available for questions at a reception at 4:15-5:30 p.m. in the Haenisch Room of Hays Science Hall. In addition, signed copies of his book, Blind Spot, will be available to purchase in the Wabash College bookstore.